The faucet set has been described as the crown jewel of any bathroom or kitchen makeover. 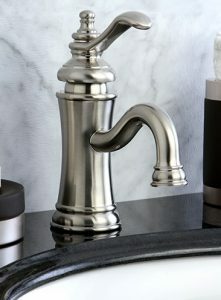 Aesthetically, faucets should reflect the overall style and tone of the room. 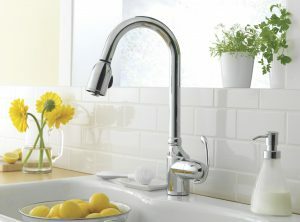 The overall apperance and function of the faucet is important whether used in the kitchen or bathroom. 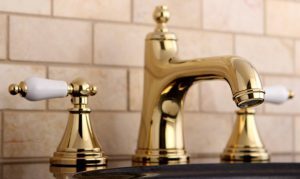 Today, faucets come in many types and finishes giving the buyer plenty of options. When buying a faucet, first determine if you have holes already drilled in the counter or wall. If so, you will need to use a similar mount faucet or choose a design that covers the holes. A deck plate or escutcheon can also be used to hide holes if choosing a single-hole or narrower base option. Here are the basic types of faucets available for both kitchen and bathroom. Single-Hole: This popular style features a single spout with mixing handle. It is a good choice for smaller bathrooms and powder rooms. Center-set: Uses 3-holes that are usually 4” between the centers of the hot and cold knobs. This style features the faucet and one or two ha ndles built into a single base plate. Widespread: Requires three holes for the 3 separate pieces – 2 handles and 1 spout. Standard center to center is 6” to 16”. 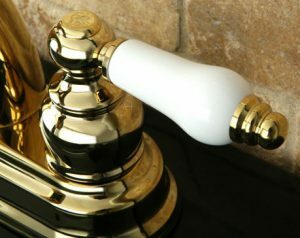 This is the most common faucet style. Wall mount: As the name implies, this unit mounts to the wall and is generally 2 handles and single spout. 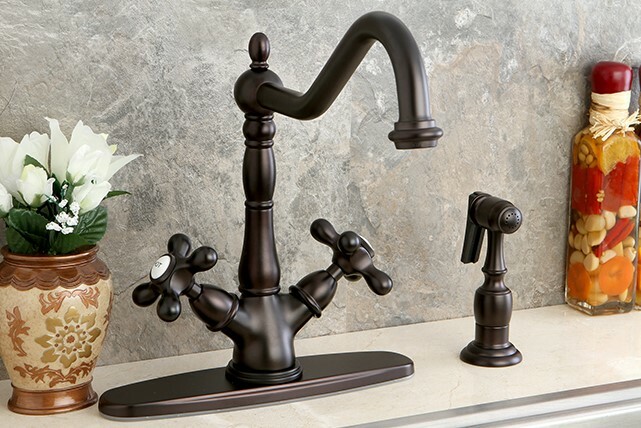 Wall mount faucets come in many styles and finishes. Pullout: This modern faucet comes with a detachable head that is connected to a hose for positioning the water. Pull down: Similar to the pullout, the head pulls in a downward direction only. Pot filler: Specially designed faucet with long, thin spout over a deep basin for filling large pots and pans. This style is generally mounted on a wall near your stove to save carrying a large pot of water across the kitchen. Vessel sink faucet: A single faucet design used with vessel style sinks, deck mount models are typically taller than most lavatory faucets. Wall mount models range in center to center measurements and styles. Water flow is controlled with various types of handles on today’s wide selection of faucets. Popular choices include cross handles, levers, joystick, round or hexagonal knobs, touchless, and touch activated. Many cross or lever handles feature porcelain accents for a vintage look. Compression valve – works by a floating stem that opens or closes the water pathway. Ball – a rotating metal or plastic ball regulates the water flow. Cartridge – uses a rubber o-ring and cartridge (usually brass) to control water flow. Ceramic disc – two ceramic discs move against each other to block water or allow it to flow. This popular style is almost maintenance-free. 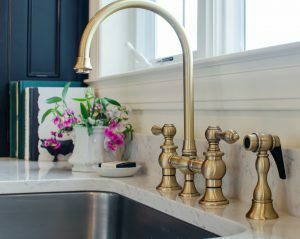 Most modern faucets are made of Brass or Stainless Steel, and in popular finishes to coordinate with any decor including: Polished Chrome, Antique Cooper, Copper, Satin Ni ckel, Oil Rubbed Bronze, Antique Brass, Polished Brass, Polished Nickel, Pewter, and more. 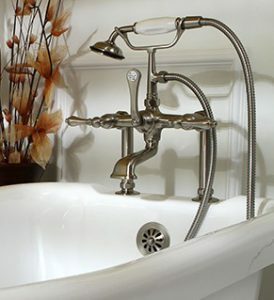 Van Dyke’s Restorers offers over 150 kitchen faucets, 135+ bathroom faucets, and over 100 bath tub faucets. Order one of the popular, eco-friendly copper sink and faucet package and save even more. View our previous blog on copper sinks and tubs to learn about these great options for your kitchen, bathroom, or bar. Claw foot tubs are one of the most sought after items in any bathroom renovation and featured on many home makeover television programs. Van Dyke’s offers a number of claw foot tubs and the special plumbing fixtures for this iconic tubs including a nice selection of both wall mount and tub mount faucet sets.